Written by Julie Beynon on November 15, 2016 . As with many SaaS products out there, people can sign up quickly for a Customer.io account to take a look around and kick the tires themselves without having to wait to see the product in a demo. Our sales team plays a role in guiding new signups through the consideration and purchase phases, and beyond. So it’s critical that the sales team knows who is creating accounts. 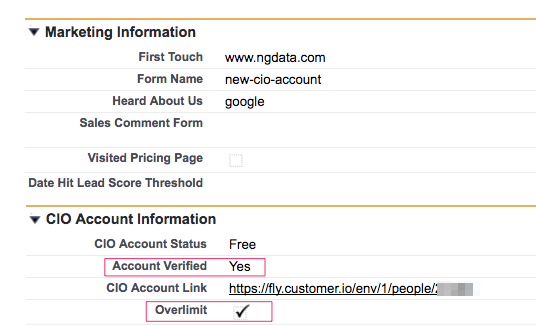 We use Customer.io Actions to push all new leads into Salesforce.com: The Action includes data from the registration form fields, like company and contact estimate. We require new signups to confirm their email address (to help keep spammers at bay as well as ensure the person who signed up is who they say they are). So we decided to also update Salesforce lead records when people complete that email confirmation step. That keeps the sales pipeline free of accounts that never bothered or wanted to actually use Customer.io. As a marketing ops nerd, I’m very excited! We’re using Actions to integrate with Customer.io and Salesforce to equip our marketing and sales team with more flexibility and power, with less reliance on our dev team to build us custom solutions. The possibilities of what we can choose to send over to Salesforce are huge, and the fact that we can curate what information to send and when makes sure that the data flow doesn’t become a useless firehose of information. Plus, the sales team can do their job without having to constantly switch to other tools. A few things we’re still working on and would love to share in the future is how we’re using product activity and engagement levels to add context to leads in Salesforce as well as power lead nurturing and winback campaigns. Stay tuned! 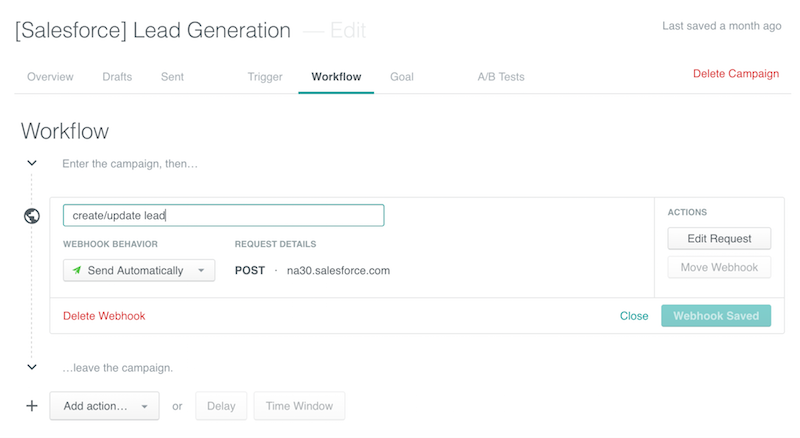 Head here for a step-by-step walkthrough of how to push leads into Salesforce from Customer.io with a Webhook Action.